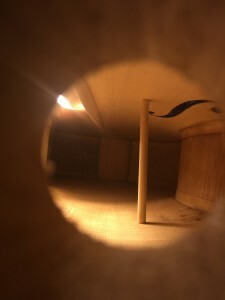 This is an image looking into the corpus of a cello through the endpin hole. The scale of the cello helps us see what is essentially the same story with all string instruments. That is the relationship betwwen the bridge and the bass bar and the soundpost. The bridge is bearing down on the delicate spruce top with the immense strain of the up-to-pitch string tension. This force is concentrated at the 2 feet of the bridge….without support the top would collapse. One could make the top thicker but that would be a poor tonal solution because the spruce top needs to be thin enough to stretch as it resonates… The key is in how you support the load. Although the arching does provide some support it is the bass bar and the soundpost that are the real structure within…..but the true genius of the design is that they also act as conduits to spread the resonance throughout the entire instrument and bringing all areas of the body alive. The bass bar ( which is glued on the inside of the top on the left in the photo) is made from a piece of spruce with perfectly straight grain ( to improve resonance) that matches the grain width of the top. This bar sits 2mm under the bass bridge foot and spreads the bass vibrations out through the whole spruce top ( while also keeping the top up). It doesn’t sit straight north to south but is glued in at an angle that mimics the taper of the instrument as it narrows from lower bouts to upper bouts.The soft, pliable spruce of the top vibrates widely and is most responsible for the richness of the lower register. There is much that goes into the fitting of the spruce bar exactly to the surface of the curving top – if the bar were glued in and not fitting exactly the delicate top will contorted to fit the bar. Once glued in the bar is carefully shaped – leaving more mass under the bridge are and tapering to the ends. I give much thought to the shape/mass of each bar …..many things are considered…Higher arching neeeds slighter bar …stiffness of the top …neck angle etc…The key is to have all the support that is needed and no extra that would hinder full resonance. The soundpost is on the right in the image. I start with the cut off end of the bass bar so that the spruce is identical and plane it to an 11mm round dowel ( the bar is also 11mm wide as it is glued in) and matching the grains of the topp as close as possible. Then the post is carefully cut on each end to match the inner curves of the top and back> With a soundpost setter I insert it in the instrument and cut/fit it to bring it out toward the F hole until it fits perfectly on both surfaces (using a dental mirror to see the far side) at a place a little south of the bridge and 2mm inside the bridge foot – the bar is als fit to be 2mm inside the bridge foot. The post transfers the energy from the treble foot into the hard maple back which delivers the higher, clear upper registers…and of course there is overlap and overtones in between. The post is not glued in….it is cut to snugly fit the topography of top and back….It can fit tightly ( the thin plates will swell to accomodate a tight post) ….tighter tends to wake up and add power….looser tends to reduce excessive brightness etc…. The post effects the sound so dramatically that the French use the term ame ….or the soul to describe it.